A discovery of a skeleton early this month, dating from 550-700 AD, with metal spikes through its shoulders, heart and ankles has revealed information of one of the few ‘vampire’ burials in Britain. These skeletons are fairly common in the rest of Europe, but quite rare in the UK. The skeleton was found buried in the ancient minster town of Southwell, Nottinghamshire, England says reports. It is believed to be a ‘deviant burial’, where people considered the ‘dangerous dead’, such as vampires, were interred to prevent them rising from their graves to prey upon the living. It was once common to mutilate corpses in such a manner to prevent the dead from rising again (see here). Matthew Beresford, of Southwell Archaeology, details the discovery in a recent report. The skeleton was found by an archaeologist named Charles Daniels during the original investigation of the site in Church Street in the town 1959, which revealed Roman remains. Beresford said when Daniels found the skeleton he jokingly checked for fangs. “The classic portrayal of the dangerous dead (more commonly known today as a vampire) is an undead corpse arising from the grave and all the accounts from this period reflect this,” the paper quoted Beresford as saying in his report. “Which of these the Southwell deviant was we will never know,” he stated. Beresford believes that the remains are still buried on the site where they originally lay because Daniels was unable to remove the body from the ground. 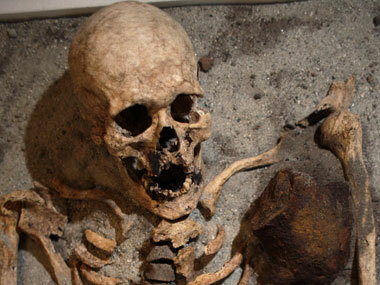 John Lock, chairman of Southwell Archaeology, said the body was one of a small handful of such burials to be found in the UK. “A lot of people are interested in it but quite where it takes us I don’t know because this was found in the 1950s and now we don’t know where the remains are,” he said. Lock said no one could be entirely sure why the body was staked in the way it was. Fascinating! I love vampire history, I love that people once believed in the undead so passionately. However, I am most definitely happy that I never lived in those ignorant and fearful times.